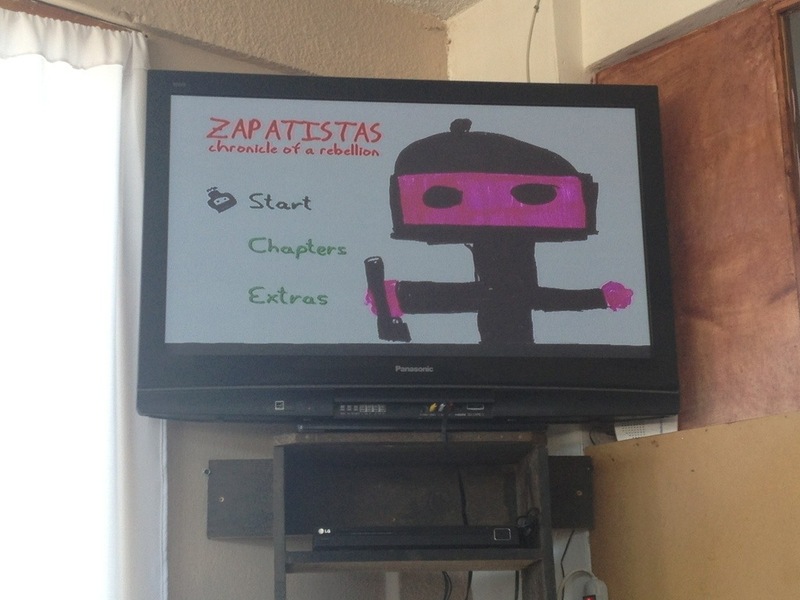 A quiet afternoon of the past 27th November we decided to follow our politically active mate, Kevin, at his Spanish school where we could learn some more things about “Zapatismo” movement through a documentary. 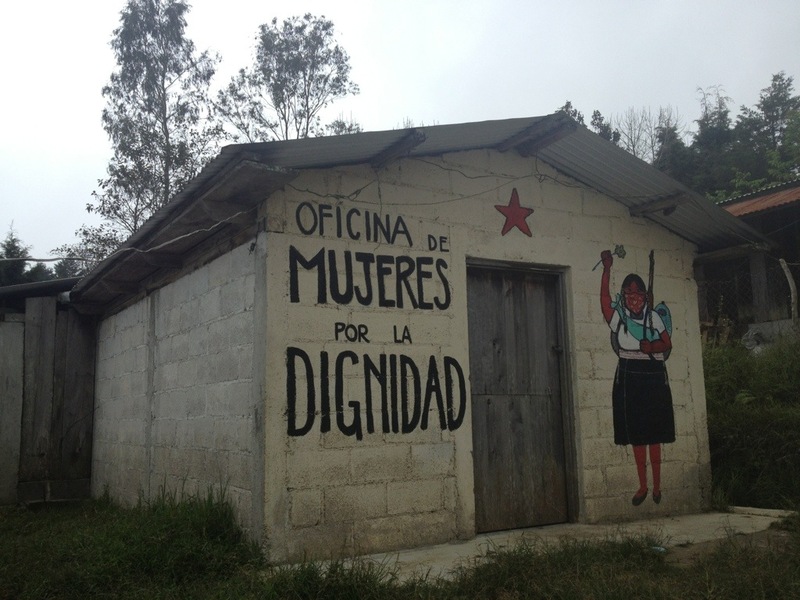 I am not a big fan of politics, but during my stay in Chiapas I have to admit I got quite curious about it. 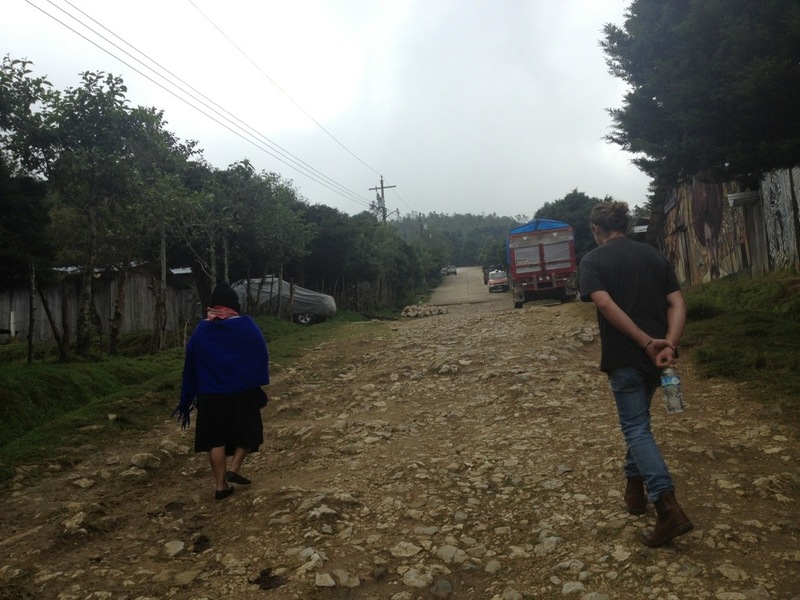 I met few people who actually travelled to Chiapas just to study its indigenous communities and support their activities. 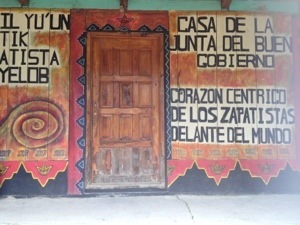 Around the end of the 70s, representatives from different Mexican indigenous groups such as Tzeltal, Tzotzil created the Indian Congress with the goal of uniting the indigenous peoples politically. Activism and resentment continued to the 1990s. 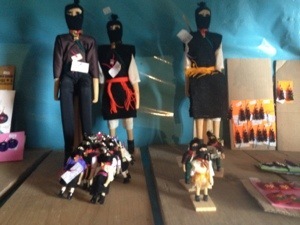 This small guerrilla band led by a man called Subcomandante Marcos called the Zapatista Army of National Liberation (Ejercito Zapatista de Liberacion Nacional, EZLN), came to the world’s attention when on January 1, 1994, the day the NAFTA, (North American free trade agreement) went into effect, they occupied the San Cristobal city hall and proclaimed their self revolting to the world. 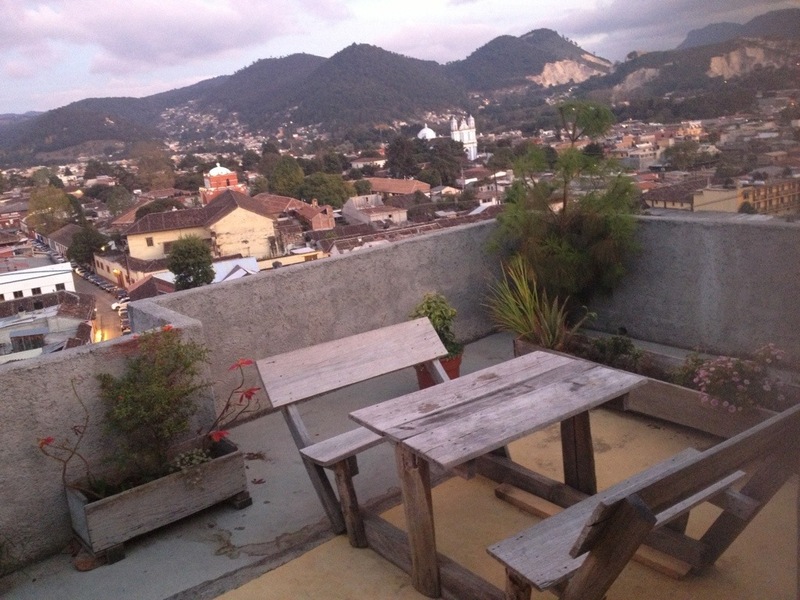 We watched the documentary and we shared our opinion afterwards in a beautiful terrace with stunning views on the town. Two large wooden benches connected to a central rectangular table, which would be just perfect for a ginger tea. But we head to the hostel instead. The following morning we woke up relatively early with the aim to get to Oventic, a place popular for hosting a big Zapatista community. 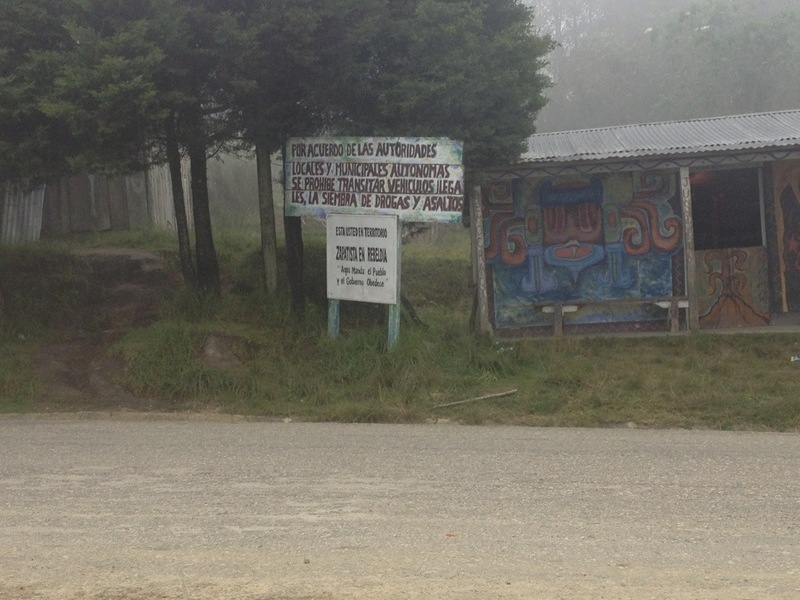 We took a taxi from the main market; fifty minutes’ drive through the foggy and wind mountains around San Cristobal. The unfriendly taxi driver left us in front of a half black half red gate with on its right a cartel saying:” halt, drivers must wait for a responsible to open the gate, those who not respect it will be punished for 24 hours. No matter who”. of course we stopped, we were aware that this people is not the most welcoming and friendly, so we waited until two short men with balaclavas came to ask who we were and why we were there. These people want to be unrecognizable to the strangers this is why they cover their faces; we told them we came from abroad and sincerely told them the reason for the visit: we were curious and wanted to learn more about their reality so far from our Italian, Australian and German one. They asked for our names and few more details, writing it on a quite damaged paper with hands proved by some manual work, I noticed black nails. I wondered if they had just been working on the soil. 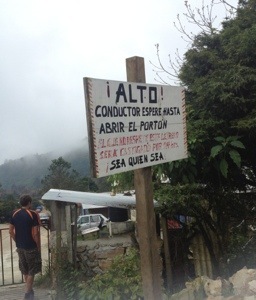 While they looked extremely focused on taking our names, we heard a persisting horn coming from a “tortillero”‘, a guy onboard an old motorcycle selling tortillas in the area. An old lady with the face covered came out and bought some. The process taking our name took quite a long time, but we were not in a rush, if it was not for the unpleasant cold we would have been even more patient. 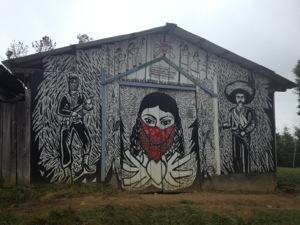 I took a look at the cartels outside the gate and one was saying: “you are in a Zapatista area; we are in an open rebellion. Here the people rules and the government obeys” and another one saying “everything for everybody, nothing for us”. Explicit grudge. We had to wait out there about 20 minutes, until one of the two guys came to open the locked gate and took us to an old lady house. She didn’t look so unfriendly but she was of few words and before taking us around she warned us not to take picture to the people as we already know. These indigenous think that taking a picture to them might steal their soul. 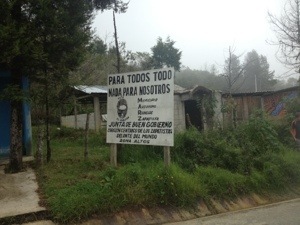 But it won’t be difficult to find some of them asking for few pesos in exchange for a photo. Would people sell their soul just for necessity? I am sure most of them wouldn’t. To any of the questions I asked, the lady would reply: I don’t know. I was expecting this kind of attitude; these people want to live in their reality and don’t spread out too much their tradition. 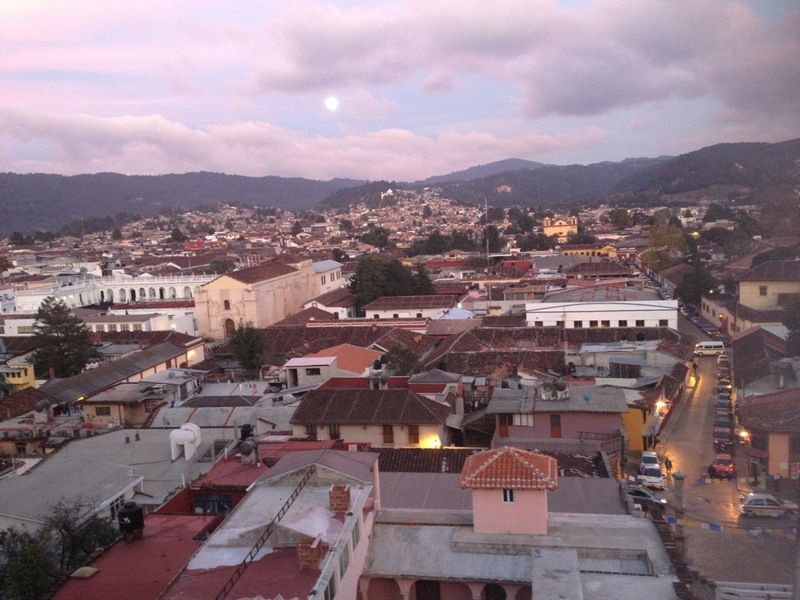 Mostly here in Oventic, but in general in all Chiapas, people is very protective of their culture, and regardless the huge rest of the world advanced modernity, here you can smell the scent of their tradition and their devotion to culture. By any means, with a resistance attitude of people who are not going to surrender easily to what goes against their beliefs. This was eventually the part I most appreciated of them. We walked through the beautiful and colorful murals and I surprisingly bumped into a big green tarpaulin covering old stuff. The bizarre thing is that it was from a brand I know very well since it is a popular Italian leather goods company based in my hometown and whose owners are friends of mine: Carpisa. I wondered how it ended up there. We stopped at the few handcraft shops that had opened just for us, and we bought something in sign of gratitude for letting us have a look around their places. This town is not how you would imagine a town; there is no paved road, few people around, an old school with some students playing and many cattle wandering around. Looks like most of these communities are based on autarchic systems, being self-sufficient and never giving up their traditional ways of food, clothing and tools gathering and making. Some of them have no jobs and make no salaries though. We stopped at a little shop who would also serve food. 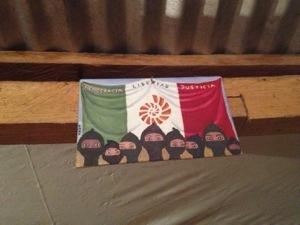 On the shelves many Zapatista souvenirs, cd, posters and books. 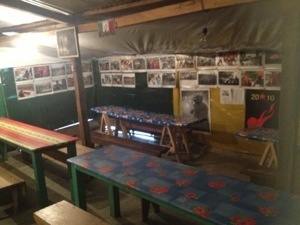 On its beside there were Zapatista movement photos hanged on the walls and few wooden tables with colorful tablecloths. 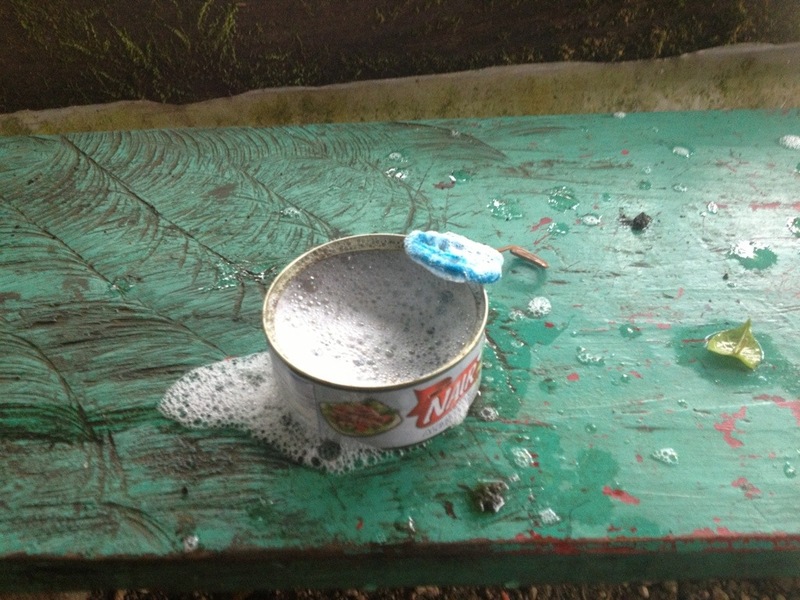 There was a lovely little girl outside playing with a tuna can with soap inside, playing bubbles. 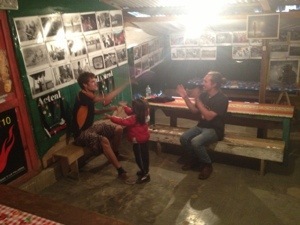 It was so sweet to see how kids can still play and have fun with no means. I tried to do some bubbles but I didn’t succeed, there must have been a trick I was not aware of. 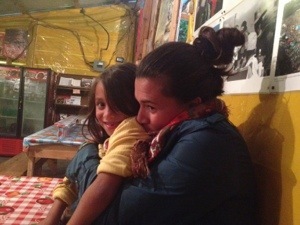 That cute little girl reminded me so much of my little niece, both for her lively character and for her aspect. Her mother worked at that kind of convenient store and would keep her daughter there while working. 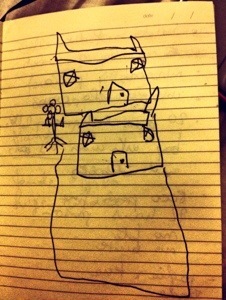 She drayed on my notebook her house and wrote her name since I had misspelled it. 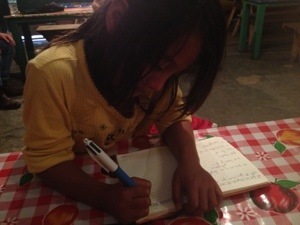 I started to speak to her by name: Xalani, she gave me such an unexpected and naughty answers; for example when I asked her if she had any special “friend” at school, she replied she had actually four boyfriends, and that even though she liked all of them she couldn’t remember all of their names. She also told me secretly she liked one of my travels mates, pointing out the beautiful Bieber (Justin), saying she liked him because he was the “whitest “. I am sure it was not for discrimination against the darker ones, but you all may know that we always like what we find unusual. In Italy we say; “l erba del vicino e sempre piu verde”- the grass is always greener on the other side. In Sweden guys would ignore blonde girls more than everywhere else in the world, opposite to Latin Americans or southern Europeans, which would find blond exotic instead. We spent a couple of hours in that kind of bistro/shop playing with the most energetic girl ever; she even played football with the guys while waiting for food. We were all astonished by this little girl intelligence and naughtiness. I even asked her if she wanted to come with me to Italy and she surprisingly replied “no grazie” in Italian, (where did she learn it?) because she had family and school here. The best answer. 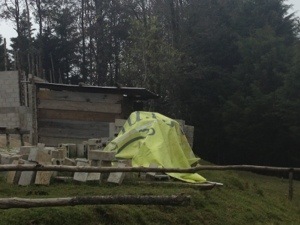 However reluctantly, we left Oventic directed towards San Juan Chomula, a little town half way towards San Cristobal. We did not get so much information about these people, but at least we could see a little bit of their ordinary day, and spent few unforgettable hours in company of members of their community.